Happy first day of fall, we made it! This is the reward for all the hot work of the summer, the weather and light are brilliant and we feel like we can work and work, or not. Sure things slow down at market some and the days get shorter but it is such a nice change of both crops and projects that it is refreshing. Unfortunately it looks like fall will be ushered in with some sloppy weather starting tomorrow afternoon and lasting into Sunday. The worst looks to be Friday but Saturday might be quite soggy too. In anticipation we not only have gotten caught up on planting but picked peppers today instead of Friday and tomorrow we will harvest the greens and other more tender vegetables. We will bring the roaster to market, we have roasted in the rain before but we will just have to see how windy it is. The fun job today was digging Sweet Potatoes. We don’t grow many, mostly for us to have some and still have some to sell at market. It reminded me that this is storage root harvest season, what does that mean? We mostly think of root crops like radishes and beets but this time of year we are also digging those root crops that have been growing all summer and can be stored for all winter use. Sweet Potatoes are certainly one of those crops along with our Baby Ginger, Jerusalem Artichokes (coming in Nov.) and Turmeric root. Just another sign of the arrival of fall. The in-between season when summer isn’t over but the early summer crops are and the first of the fall cool season crops are a month or so away; especially when the frequent rains and heavy morning dew put the disease death blow on the tomatoes, cucumbers, melons and other cucurbit family crops. Thankfully we have peppers to span the gap. I had a chef, new to the area, comment the other day about the fact that he was being offered winter squash by local farmers in July. I explained that if we wait here to plant them so that in theory they are ready in September or later the likelihood of actually harvesting any is very low unless one sprays them regularly with fungicides and insecticides. The beautiful thing about winter squash is it is a storage crop. So while we continue to plant and wait on the fall crops the dismantling of the summer crops begins. The first of the earliest tomatoes have already been taken out and soon the rest will follow along with the trellis and second planting of celosia, mowing to follow. Don’t forget about our remaining farm dinners this week. Tomorrow will be a great set of dishes from Bret at Elaine’s on Franklin you can see the special menu here. 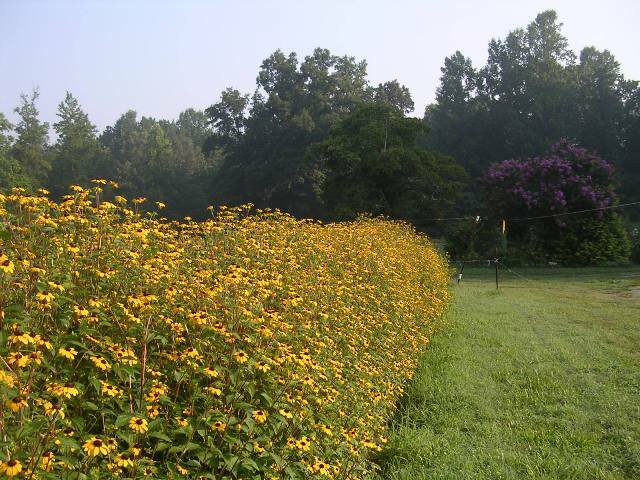 Lastly, Saturday, we are going to have a fun dinner at Panzanella in Carrboro where we are co-farmers for their monthly farm dinner along with our friend and graduate of Peregrine Farm, Joann Gallagher of Castlemaine Farm. Finally a good rain from the remnants of Lee, 2.5 inches and while a great deal of it ran off because it came down so hard, it will make things a lot easier over the next week or so. Of course our driveways got hammered so I spent part of yesterday dragging them back up the hill and will finish the re-grading today, just part of the regular farm maintenance. It is beginning to seem like fall now. The days are getting noticeably shorter, the sunrise later, the temperatures consistently cooler and the dews heavier. 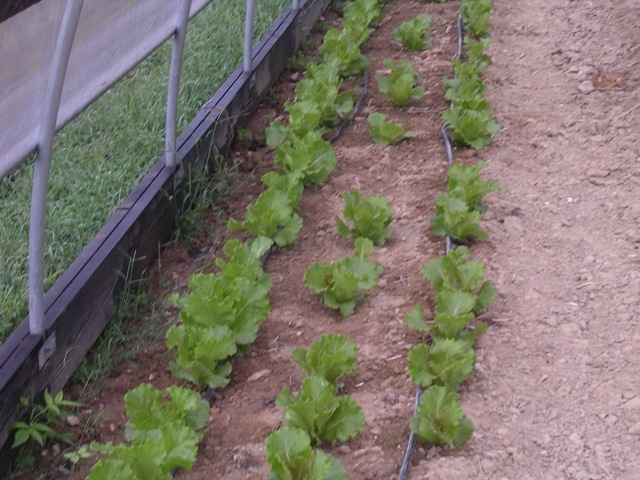 We pulled the shade cloth off the little tunnels this week as it is no longer needed to keep the crops a bit cooler and some things, like the lettuce, will actually start to get leggy trying to stretch for some more light. Our main focus now is planting for Thanksgiving and getting the fields ready for winter cover crops. To that end the collards and kale went in yesterday to join the carrots, beets, celery and Brussels sprouts already in the little tunnels for Thanksgiving. Soon we will finish the plantings for the big food day with some Green Boston lettuce, turnips and radishes. We plant all of this in the little tunnels so we can control (as much as possible) the temperatures and growth. To try and hit one day with vegetables is like throwing a dart at the bull’s-eye, sometimes you miss. 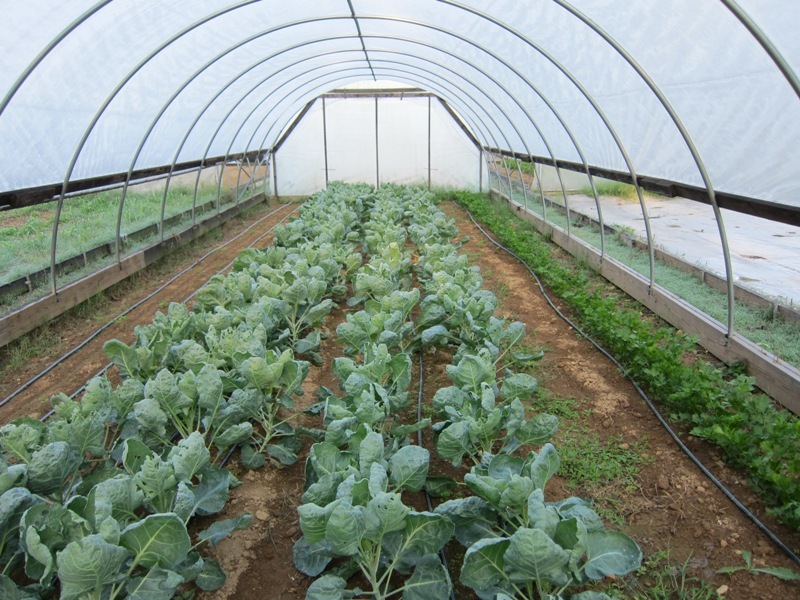 With the tunnels we can at least adjust a bit, if it turns out to be a cool fall we can close them up, particularly at night, and keep things growing more vigorously than if we just had everything out in the field. Turkey reservations are rolling in and over half are now reserved. If you haven’t thought about it yet all the turkey information is on the webiste. Look for the order form either at the top of the page or near the bottom under “How do I reserve one of the special birds?” You can easily download the Word document there. We will also have the order forms at Market on Saturdays through the end of the month. As the fall goes on I will continue to update the website with how many are available. Can we have another week off and come back to cooler temperatures this time? “Week off” would be a misrepresentation of the facts, somehow it seemed we like we were over scheduled and just went from one thing we needed to do to the next. Sometimes that happens when what appears to be open time gets filled with all the things you haven’t gotten done the last few months, you know like getting the car tires rotated. 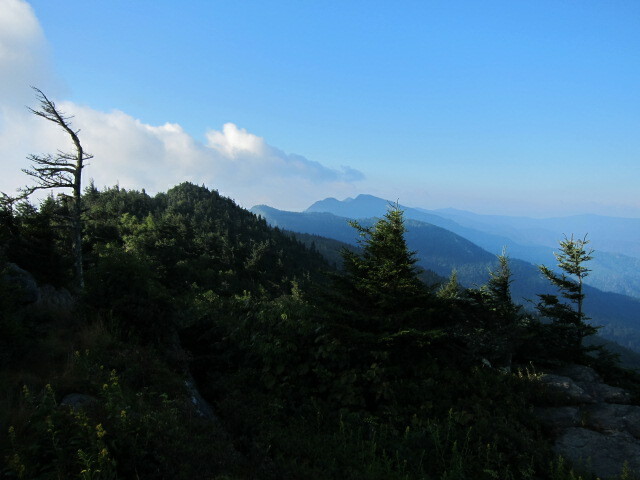 We did have several enjoyable meals with friends and I did escape to the mountains for a few nights. In between there were tomatoes, peppers and flowers to pick; turkeys to move, water and feed; soil tests to pull, mowing, mowing, mowing. We’re back and ready to face the end of the season. It does seem like with the heat and the rains that the grass and weeds are in overdrive. Some of it grew a foot in a week so the first job for the guys was to join in with us to try and beat the grass back so our collective quality of lives would be better. We are now in the early stages of taking things apart for the winter. I know it’s only August but when you spend most of the year building and installing things to support and grow plants, you have to pace yourself on taking it all down. 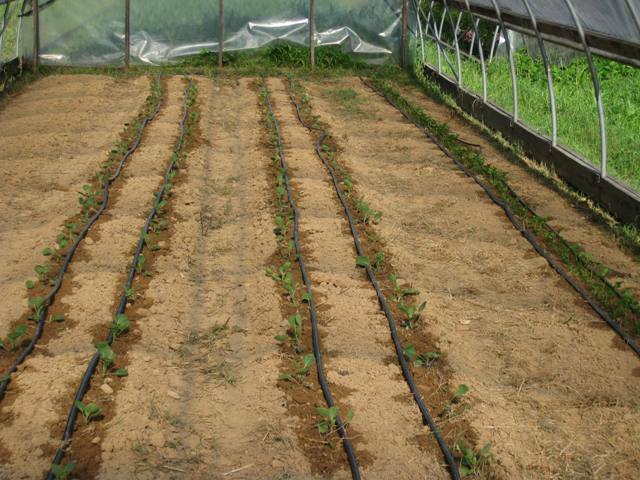 Already we have taken out some flower trellises and lots of irrigation lines. Today the earliest tomatoes get pulled out of the little sliding tunnels to make way for Thanksgiving and winter vegetables and flowers. They gave us all they could over the last ten weeks but now look really sad. 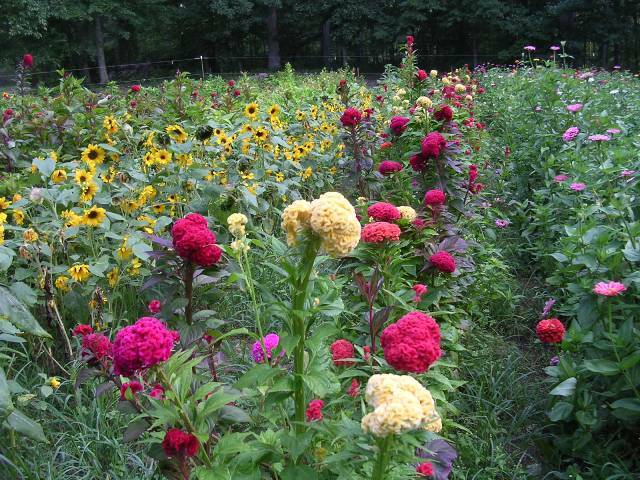 The next few weeks we will continue planting vegetables for Thanksgiving and, believe it or not, flowers for next year. Leeks, Collards, Beets and Carrots next week and then in early September the first of the overwintered flowers like Larkspur and Bachelors Buttons. The cycle sometimes seems surprising in it’s timing but after years of doing it we’ve gotten used to it and know that it is what has to happen. Soon it will be time for winter cover crops and all the rest. What week off? It was 51 degrees at 6100′ last Saturday, hmmm. Well we are extremely glad that the extreme heat wave has broken and for the rains we have gotten. Things were getting really crispy out there, plants and people. Our creek ran dry ten days ago and the pumping pond is down to the point that I will need to begin running water into it out of the upper pond (mostly recovered from the mysterious self drain) or the well. These rains will give me a few days respite and time to get the alternatives hooked up. 102 degrees last Wednesday at market was a bit much too! Last Thursdays Farm Dinner at Foster’s Market went very well and the wide ranging group, including lots of kids, seemed amazed at all the different kinds of tomatoes. This week is the Carrboro Farmer’s Markets Annual Tomato Day, something like the 15th one. This years theme is about the origin of the tomato from South America with three dishes representing the tomato as it moved around the western hemisphere. There will also be a display of most of the different tomatoes available at market, many of the vendors will be sampling their fruits, music and kids stuff too. Dia del Tomate, be there! Of course in classic Peregrine Farm style, we will have very few tomatoes to present beyond our wonderful reds as the peak of heirloom production has passed and is dropping precipitously. Most of the restaurants we supply will not be getting heirloom tomatoes this week, just not enough to fill their needs. Otherwise it has been a normal mid summer week, a little mowing, some work in the peppers and the first plantings for fall. This week we put in the Brussels Sprouts and Celery for Thanksgiving and the first of the late summer lettuce to be harvested in late August. Sort of a normal week for us, just what we needed to recover from vacation! We are beginning the process of putting the farm to bed for the winter that goes on from now until November (I know it is still August but the job has to be started at some point). 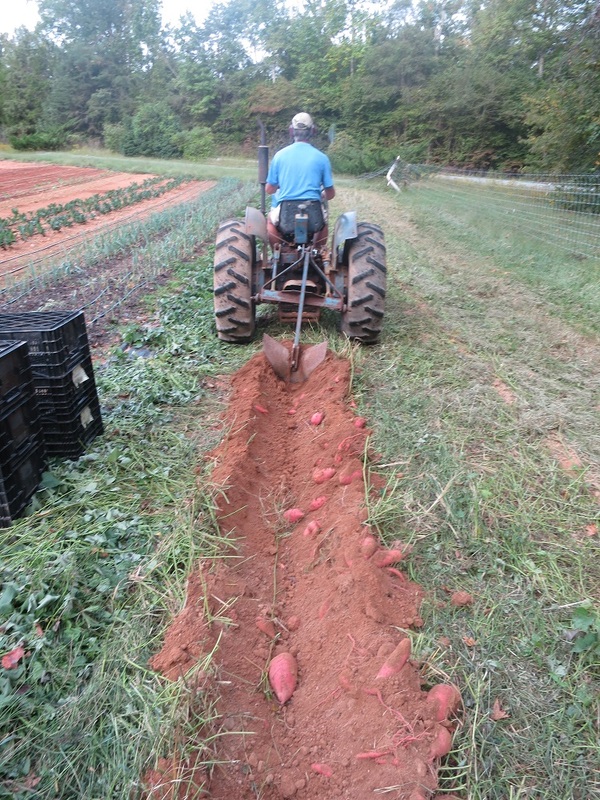 The first major act is pulling out the first planting of tomatoes and preparing that ground for a winter cover crop. Slowly we will be taking out the summer crops and seeding them down until the whole place is a carpet of brilliant green cover crops. Leeks for Thanksgiving went in the ground along with kale and more radishes. Speaking of Thanksgiving it is Turkey ordering/reservation time. As I have told folks all season we like to wait until the birds get old enough so that we have a good idea of how many we will actually have in November before we start putting names on paper. Even then things can happen and we can lose birds like we did last year, with four weeks to go, when something got in and killed three birds. There are some changes from last year that you should be aware of. We had a meeting with our processor last week and due to their higher production numbers we are going to have to have our turkeys processed two weeks before Thanksgiving. This means we will have to freeze the birds to hold them until you pick them up on Tuesday November 23rd. 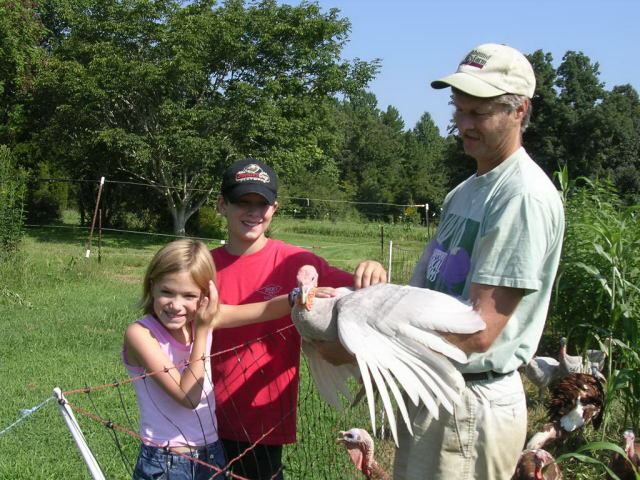 There is just no way we can hold them safely as fresh/unfrozen birds that long. We understand if you want a fresh bird and decide to buy one elsewhere. We can tell you that the frozen turkey that we have been eating all year has been fabulous without any loss of quality. It may also be more convenient for some who need to travel with their bird such as one person who plans to take one to France! The second change this year is in the price per pound of the Heritage turkeys. After crunching the numbers from last years birds we realized that due to the longer growing time, higher initial bird cost and the lower average weights that we needed to raise the price to $4.00 per pound. The Broadbreasted Whites will continue to be $2.50 per pound. That still means that a turkey will cost between $30 and $60 depending on the size. The Heritage birds will run from 7-15 lbs. averaging 10 lbs. and the Broadbreasted birds will run from 15-25 lbs. with an average of about 20 lbs. This is how to reserve your Thanksgiving bird. We take reservations on a first-come-first-serve basis, those who had a turkey last year will have the first choice. We are announcing this first to those of you receiving the newsletter and then we will put a sign up at market in a few weeks if by chance there are any birds left. After 21 Saturdays Peregrine Farm’s marketing season is three quarters of the way done! Whoopee! While the market itself continues on until Christmas we decided in 2000 to stop at the end of pepper season and not to grow the fall cool season crops. With a sustainable view of our world we know that the most limiting part of our system is labor, and especially for us is our quality of life. We realize that if we cannot renew ourselves then eventually the whole thing will grind to a halt. This also represents the social part of the sustainable triangle. The economic part of this decision came by looking at the numbers it took to go until Thanksgiving, and the return, we decided that it wasn’t worth it for us. Turns out we were right, we make more now that we don’t market for the additional seven weeks or so than we did before. Part of that is we personally are in better shape to manage the main season (see part one) and the other is the third leg of sustainability, the environmental side. We forgo the fall crops, let the soil rest, get our soil improving crops planted just right and put the farm to bed for the winter in better shape, ready to go for the spring. Of course as you know, 27 or 28 weeks of marketing doesn’t mean we have the rest of the year off, we are just working on other parts of the system. Also after 21 weeks straight it is time for a break. We have always taken a break the beginning of August after the early tomatoes wind down and before the peppers kick into full speed. After the ugly hot weather of July we give the staff a week off with pay and we slow down a bit so we can all pull on through to the end. So to that end we will be at the markets this week and then take the week of August 7-14 off. No markets next week and no newsletter. Nothing exotic for us while we are off, maybe the the beach for a few days, and maybe a few other excursions close by. There are still the turkeys to keep an eye on and plants to water but by and large we will be lounging with our feet up! Good news of the farm front though, turnips, radishes, lettuce all for September are in the ground. Brussels Sprouts are planted for Thanksgiving and the leeks go in this week too! Good rains last week have made all of these crops very happy. By the way tonight, Wednesday, Panzanella restaurant (another of Weaver Street Markets businesses) is having another of their “Featured Farm” dinners where they have a special menu built around what the featured farmer has in season. Tonight it happens to be us! We took them lots of tomatoes of all kinds, cucumbers and peppers. I know for sure that one dish will be poblano peppers stuffed with their house made chorizo sausage! It should be an enjoyable eating experience. Betsy and I will be there after market to eat our way through the menu, come by and see us! Well it was a whirlwind trip to Wisconsin but we survived. We attended some interesting workshops and went on a great tour through the beautiful countryside to an excellent small meat processing plant and retail store (had to see where all those sausages are made), then to a mushroom farm and store. 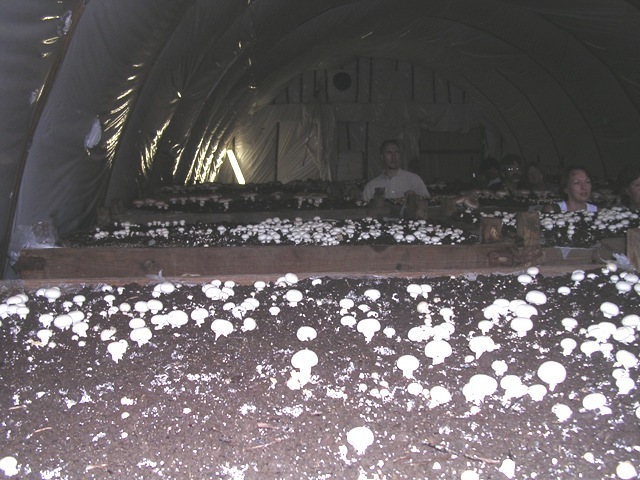 Betsy was pleased to have finally toured a mushroom operation as her mother tried for years to get them on one in Pennsylvania and never succeeded. Betsy’s mother was a great adventurer and wanted to show her kids where stuff came from. Instead of just going to museums and zoos they went to factories and farms and out of the way places, you can begin to see where Betsy gets her interest in all things cultural. As we accepted the award I told the crowd about the survey I had just heard about where more Americans know the names of the Three Stooges than the three branches of government. My reason for doing this was to point out how hard it was going to be to make Americans aware of the three tenets of sustainability. Now I am a basics kind of person, just keep reinforcing the major points and the rest will fall in place. Of course those of you who have received this newsletter for any time already know those three tenets; environmentally sound, economically sound and socially responsible. Those along with Slow Foods three guidelines; food that is good, clean and fair are how Betsy and I have tried to organize our lives. It is hard at times to meet them all but if we try to at least keep them in mind when we make decisions here at the farm then generally we make a better decision than we might otherwise. We want to thank everyone who called or e-mailed to congratulate us on the Patrick Madden Award, it is a little overwhelming. A friend of ours, who was on NPR this spring, warned us that we would get messages from people we hadn’t seen in years, she was right! Back to real world. The staff did a great job while we were away. The celery (for Thanksgiving) and lettuce (for September) were transplanted and the turnips, radishes, and carrots are seeded and up now. We are headed towards getting all the rest of the Thanksgiving crops in over the next few weeks, the lettuce and collards have been seeded in flats for later transplanting, soon the spinach, radishes, turnips and carrots will be seeded in the sliding tunnels so we can keep them growing actively up to Thanksgiving as the nights begin to get cooler. They got the last layers of trellising on the peppers as the plants are becoming heavy with fruit, high up on the branches, without support those branches will break off. 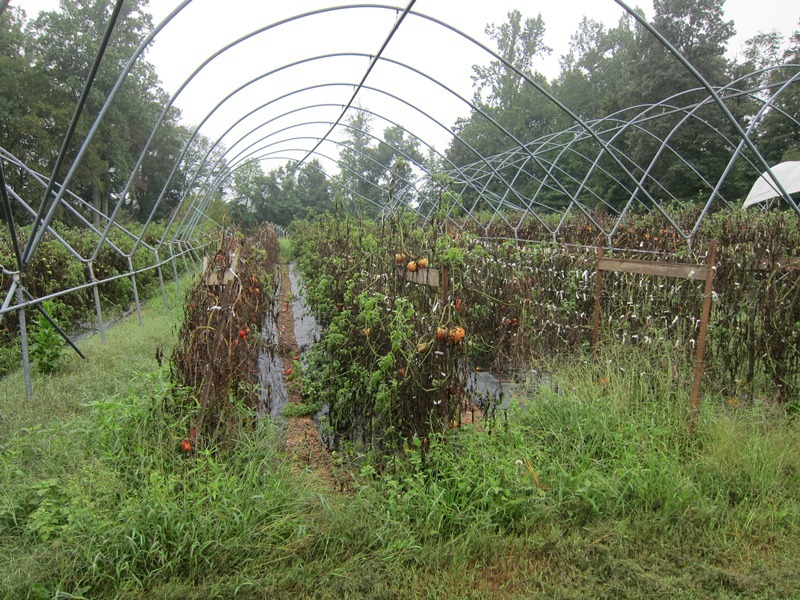 The early, early tomatoes in the sliding tunnels were taken down yesterday, a dirty job as the old vines have to be ripped off the trellis fences as you try to not splat yourself with an old oozy tomato still hanging on. No more Early Picks or Orange Blossoms. It is getting so dry now that everything that is not irrigated is getting really crispy. We had to pull the first water out of the upper pond as the creek is still not running. Good thing that we made sure to refill that pond this spring! So now the end game begins, as one by one the crops finish up and are taken out. Over the next few months we will begin to plant the whole farm in winter cover crops like a blanket, putting the farm to bed for the winter. It is amazingly dark these mornings and it makes it hard to get going. We pulled all the shade cloth off the little tunnels this week because the days are getting so short that the crops that were under the shade get too leggy trying to stretch for the diminishing light. In August those same crops (lettuce, Brussels sprouts, celery, etc.) can’t take the heat so we give them the extra shade to get them going but with a snap of the fingers it becomes too much shade. We now know that Labor Day is the changing point and by then the heat has begun to break as well. Ernesto brought very nice rain without much wind, we had 2.5 inches that came down gently. Then we had a monsoon type down pour on Monday with 2.5 inches more in about thirty minutes. The river didn’t rise much and the creek is barely running again but things look much better around the farm, now the ground will not be so dry and I can begin to get soil ready for the fall and winter. The early tomatoes get taken down today as we have to make way for planting campanula and other flowers for next year and so the preparations for the next season begin in earnest. This is sometimes a difficult time of year for us as we have one foot still in this growing season, trying to make sure we get everything we can out of the crops that are left, and one foot in the next growing season. We know that a big part of next year’s success is rooted in what we do over the next few months and so we become a little schizophrenic this time of year as we look way ahead while trying to keep a focus on the last few weeks of market. This is one of those “sustainability” things that we realized a few years back. In a conventional farming system the plans for the next growing season or crop only need to be made just before planting happens. A conventional farmer may make the decision on how much corn to plant based on the commodity market in the spring and then just has to use fertilizer in a bag and plant. For us the crop rotation dictates what crops go where and how much we will plant is based on what, you, our customers tell us you want. Most of our “fertilizer” is from the organic matter in the soil that we resupply by growing cover crops in that same soil and then turning them under. It is a much longer term view of farming. That is why we stopped raising the fall cool season crops so that we could instead concentrate of getting the farm ready for next year. Of course being able to go on vacation in October is not a bad side benefit either! Depending on how we look at it, it has been either 20 or 24 weeks since we started going to market. Twenty occupying our regular Saturday spot with two spaces but with the market going year round now Betsy started going four weeks earlier with the first few anemones and ranunculus. Either way it’s a long time without a break. Twenty weeks for the staff as well, hot, cold, wet, dry, steamy, arid, seeding, planting, weeding, cultivating, harvesting. Twenty weeks of dealing with each other and us, time for a pause. As most of you all know we take a week off, every summer, in early August timed to hit just as the early tomatoes wane and before the peppers really kick in. Now I always refer to it as the “break” and not a vacation because Betsy and I don’t really get to check out. We give the staff the week off with pay and they usually leave town. That leaves us here to water, and irrigate, keep and eye on the turkeys, pick a little bit of stuff that has to be harvested, etc. The break is in not going to markets and doing regular deliveries. We usually do a few hours of chores in the cool of the morning and then find some kind of diversion in the afternoons, eat a lot, take naps, read and other general sloth. To that end there will be no newsletter next week and we will not be at market Wednesday 8/6 and Saturday 8/9. This break marks the transition into fall and gives us the bit of rest needed to head into this most important time of year for the farm. The ten weeks that follow the break are not only the end of our harvest season with peppers, tomatoes and the last of the summer flowers but it is the start of the next year. We are busy dismantling all of the infrastructure we put in place all season to grow and support the crops; irrigation, trellises and more. At the same time we are busy seeding and transplanting flowers for next spring, improving the soil with mineral amendments and seeding cover crops. By mid October it will all be put to bed for the winter save a few hundred feet of row for the vegetables for Thanksgiving and the turkeys wandering around in their pasture. In many ways the next growing season is decided and set in place during this period, we take it very seriously and when it’s done we then can take a “vacation” and rest assured that next year will be another good one!